This recipe can double as a snack, breakfast, or dessert! It's just that awesome! Personally, I go for snack or dessert, because I prefer something a bit warmer for breakfast. When I'm in the desserty mood, I top it with some melted chocolate. Of course. Like everything else I make. This chia pudding is amazingly filling. The chia seeds, after they've fully absorbed the liquid, fill your stomach, and are packed with fiber, protein, and omega's three's! They keep me full for hours afterward, and that helps me power through my day. Try if out for yourself! While chia seeds are soaking, blend the frozen banana, berries, coconut milk, and maple syrup in powerful plender. Adjust liquid as needed and pulse until blended smooth. When chia seeds have absorbed the liquid, whisk in cacao powder and salt until thoroughly blended. 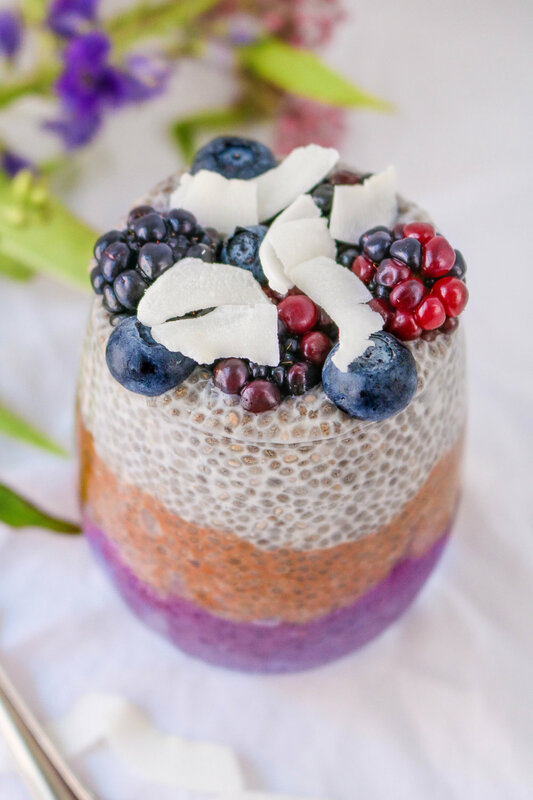 Pour chia pudding on top of berry layer and top with peanut butter, coconut, and maybe one of my cookies! Want more recipe ideas? Check me out on Pinterest and Instagram! Connect With Me On Social Media & Yummly!